Deborah Poppe, of West Hempstead, Long Island, said her eighth-grade son was similarly puzzled by a question, which drew complaints for a second straight year, about a busboy who failed to clean some spilled root beer — Mug Root Beer, to be exact, a registered trademark of PepsiCo. '"Why are they trying to sell me something during the test?'" she quoted her son as saying. "He's bright enough to realize that it was almost like a commercial." "There are no product placement deals between us, Pearson or anyone else," said Tom Dunn, an Education Department spokesman. "No deals. No money. We use authentic texts. If the author chose to use a brand name in the original, we don't edit." The AP wire's story about the brand names of products appearing in this year's New York state 2014 ELA exams has been reprinted in hundreds of news outlets around the country and overseas. As a publishing professional, I have my own take on it. Life Savers, iPods, Nike, Mug root beer, Barbie, Singer sewing machines, IBM, and FIFA, trademark of the International Soccer Federation. Mug Root beer, IBM, and FIFA and trademark symbols were included in last year’s ELA tests as well. The statements from NYSED and Pearson are misleading. Passages published in a magazine, newspaper, or book would never have (R) or (TM) symbols after a brand name. There is no legal reason for those symbols to appear in print. This is stated in the AP Stylebook and Chicago Manual of Style, both industry bibles. Dunn claims "We don't edit." This is not true. Pearson did in fact edit the original material; they put those symbols IN. And why NOT edit? Even though the original works might use brand names, Pearson could have edited them out in order not to distract the children. Skelly's statement is just as disingenuous. There would be no reason or "procedure" to "include" the symbol. As a copy editor, in my twenty-year career I have never had to obtain permission to use a brand name on behalf of an author. And, an author would not stipulate that reprinting his or her work would require adding the (R) or (TM) symbols for included brand names. What permissions laws and procedures is she speaking of? Did no one else at Pearson correct her? New York is a media capital, many of whose professionals are public school parents. Who do NYSED and Pearson think they're kidding? The eighth grader is absolutely correct: the (R) and (TM) symbols appear only when the brand is selling its own item--such as Mattel's American Girl and Barbie dolls on its web site. Adding them to previously published work reflects inexperienced, shoddy work on the part of Pearson and NYSED. Oh, and speaking of Mattel: their American Girl doll sets include miniature Pearson Math textbooks. 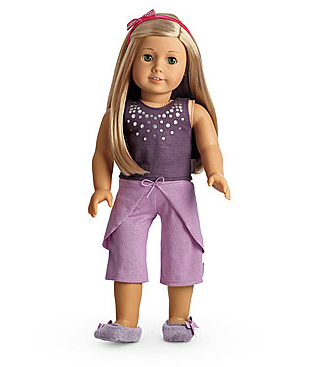 AND, how very convenient that Barbie (TM) appears on the Pearson-produced 2014 ELA! So did our children think they had to write out "Barbie (TM)" in full in their answers in order to be correct? Did kids as young as third grade have to wrestle with this as well as deal with numbered paragraphs that they had to refer back to? And field test questions, which have helped to make the ELA almost twice as long as the SATs? What other problems did New York state kids have to put up with so that Pearson can build up a bank of usable test questions to sell to other states? I urge fellow parents to demand that NYSED release the test questions. And this fall, make an appointment to see your child's essay responses. The secrecy of the New York state tests is unconscionable. And the math portion for grades 3-8 is next week, April 30-May 2. -- Edith Baltazar is a New York City public school parent and freelance copy editor for major book publishers. I completely forgot about American Girl and Pearson. I called American Girl last year and asked about the product placement. They said they wanted the doll to look like she was having an authentic academic experience, hence use of the Pearson textbook. I then gave the poor woman in the Product Development Department a little education of my own! Maybe on next year's test, there will be a question on the difference between monopoly and Monopoly. Commercialization is the common corps.